If you're a cat owner or have someone in your life who is, you'll want to look at this list of free DIY cat tree plans so you can build that lucky kitty their very own play place. These free cat tree plans include photos, diagrams, and step-by-step building instructions so you can build a cat tree that's perfect for your cat and the space you have to put it in. You'll find plans for the traditional cat tree but also for a cat condo, house, and simple stand. It's a ​straightforward building project that you should be able to put together with ease for a reasonable cost. If you like these free woodworking plans, you might also like plans that help you build a dog house, chicken coop, birdhouse, rabbit hutch, deer stand, jewelry box, tree house, loft bed, deck, or porch swing. This free cat tower plan at Imgur stands 6 feet tall with 2 platforms - one at the top and one a few feet from the base, as well as an empty, carpeted inside for the cat to move up and down through. There are several images in this plan as well as specific instructions on what to do to build the whole thing. This is another cat tree that should be very simple to build. It's made up of 5 platforms with 4 supporting beams. The second half of this guide at wikiHow shows how to make a different cat tree by using an old wooden ladder. Brittany Goldwyn has designed this DIY cat tree that's more than just fun for your cat, it also looks like a piece of natural art you can place anywhere in your home. Using real tree branches, plywood, stones, rope, and faux greenery, your indoor kitty will love their new cat tower. There's a supplies list, building instructions, and color photos to help you build this beginning woodworking project. dadand.com has this one-page PDF file that serves as a guide for building a cat condo as seen in this picture. Including the bottom piece, this cat condo is comprised of four platforms and three support beams. The whole project is estimated to cost around $25 and take two hours to finish. HGTV has a free cat condo plan that uses PVC pipe covered with rope for the stand and three baskets that are attached with brackets that are just waiting for your cat to hop in. There's a materials list, color photos, and written instructions to help you complete this project in an afternoon. 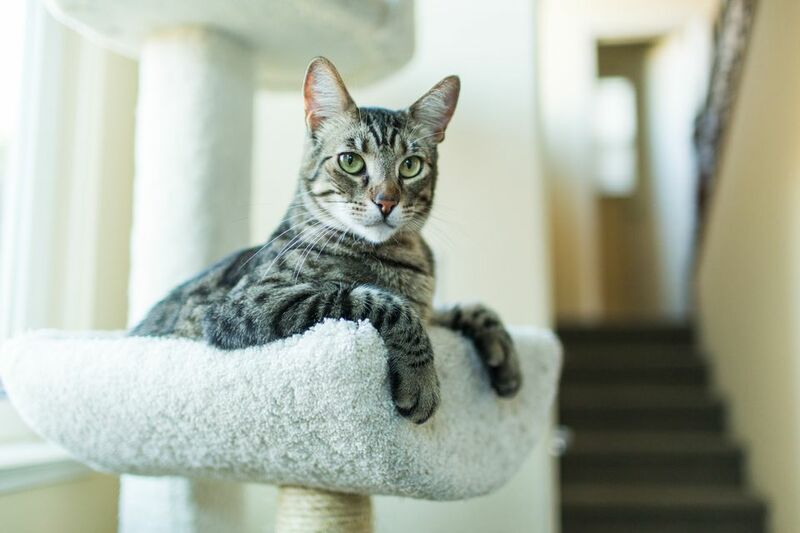 Pickle Perfect has a more elaborate cat tree plan that includes multiple perches, a hiding spot, a hammock, and all sorts of places to scratch and play with toys. Included in this free plan is a list of materials, written instructions, and color photos. 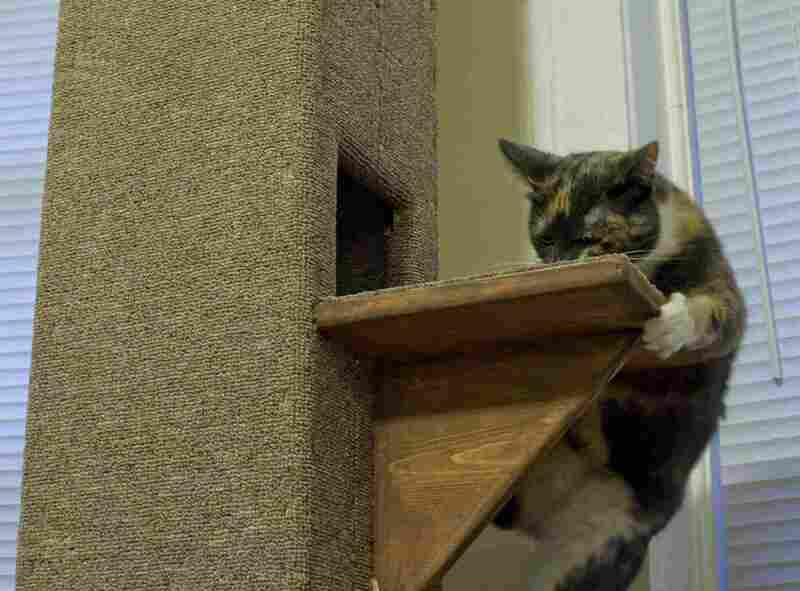 This free cat tree plan explains how to build 3 platforms with ramps to access them. The estimated cost to build this is $20 to $50, and it should be easy enough to put together even for beginners. There are a total of 10 steps in this guide, plus a tools and shopping list and several real pictures you can refer to as you move through them. A PDF version of this plan is also available. ShowCatsOnline.com's free cat tree plan seems to have it all. It includes a top platform, small home, bed, and a tube, all of which is fully carpeted. The plan shows you everything you need for putting this together, including the list of materials, all the basic tools required, and 15 steps. Included in this plan are a materials and tools list, color photos, and written instructions.